D4829, originally uploaded by yukihisa. Ophelia Benson at Butterflies and Wheels exposes the hypocrisy behind the political grandstanding over Terri Schiavo by Bush (and his appalling brother). Link: Quiet chant of 'hungry, hungry' rouses a nation to oust Mugabe - Newspaper Edition - Times Online. The people of Gwanda had been gathered to hear the president tell them why his party, which has been in power throughout Zimbabwe's 25 years of independence, should be voted in for another term. Instead, they thought about the fact that the Lutheran priests who used to bring them food had been driven out by the government and a low chant of "hungry, hungry, hungry" reverberated through the crowd. 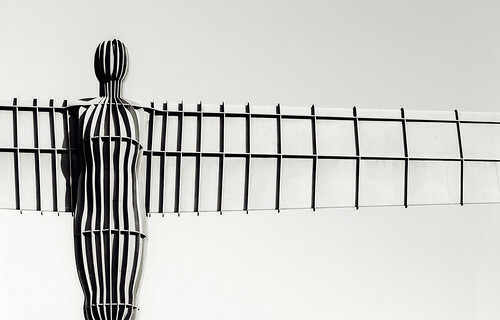 Angel of the North, originally uploaded by pdcawley. I stil haven't had the chance to have a proper look at this, although I was born only about 3 miles away. This will have to do for now. From the Adam Smith Institute Blog. the privatization that we pioneered in Britain in the 1980s involved taking basket-case state monopolies, making them competitive, and allowing the general public to acquire some meaningful ownership in them. I wonder - did this include the theft of the TSB? The world that is becoming. You start from where you are, dream a bit, apply the dream to the present and watch the outcomes and keep correcting. You won't ever get exactly where you wanted to go, but it is the best you can possibly hope for. Doesn't it seem familar though? - but I don't think the Wobblies would go down well on Samizdata do you? The Tory proposal to make trespass a criminal offence when committed by travellers caught my eye - the idea that a particular action is an offence only based on the social group you occupy is truly bizarre and worrying. The usual suspects have ridiculed any references to the Nazis in this context, but we really should be very concerned by this. No you haven't misread the title - apparently every year Ringling Bros Circus walk their elephants through the Queens Tunnel in New York to Madison Square Gardens (in the middle of the night too). This year it takes place on March 22nd. Read more here. I can't wait to see the photos! I'm away from home again for the next few days so won't be posting. However I'm preparing something on two urban spaces in Dublin - Wolf Tone Park and a new public space in the Smithfield area. 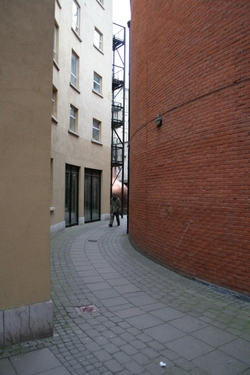 The picture shows a side lane in Smithfield near to the old Jameson's distillery. That metallic glint you can see is an old still used as the centrepiece of a small square - almost sculptural. Is there no end to their pomposity?